Neither left nor right impressed by Hosen Le'Yisrael chairman's first public speech. Former IDF Chief of Staff Benny Gantz, head of the Hosen Le'Yisrael (Israel Resilience Party), was criticized from both left and right on Tuesday following his first public speech in which he officially launched his election campaign. "Whoever says that he is neither left nor right is actually left. Immediately after the elections, Gantz will join forces with [Yair] Lapid and the rest of the left-wing parties and form a leftist government. 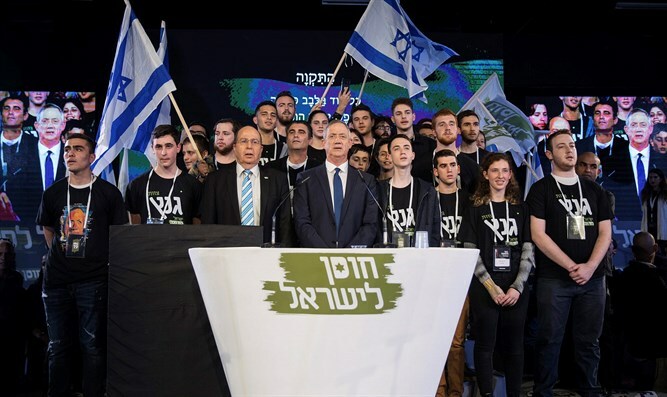 The left's old trick of putting a general at the top of a list to topple a right-wing government will not work this time on the nationalist camp," added the Likud. Knesset Speaker Yuli Edelstein criticized the speech as well, saying, "There is nothing new under the sun. It is expected from someone who is planning to run for the leadership of the state to at least establish a path, values, and not to simply do with flattering signs and rhyming slogans. Only the Likud has a path, and that’s a fact. Only we have history and roots. We march generation after generation down the same path, even when it is difficult and sometimes not rewarding. But we will never change our position or wait to open our mouths based on polls and whims." Interior Minister and Shas chairman Aryeh Deri said, “Benny Gantz, after weeks of silence, your message to the people of Israel is civil marriages and a Reform Western Wall? Public transportation on Shabbat? No Benny, this is not the way to unite the people, but rather to separate them. Do not tear apart the delicate fabric that connects us as a people, do not touch the tradition of Israel. Shas. Judaism comes first." MK Yoav Ben Tzur (Shas) blasted Gantz and said, "The former Chief of Staff, Benny Gantz, crossed red lines in his attitude towards the status quo and the provocative blow to the Jewish character. Just like the others who are similar to him, it is only a matter of time until he ceases to be relevant. Gantz sounded like a Meretz activist tonight." Deputy Health Minister MK Yaakov Litzman (United Torah Judaism) said in response to the speech, "Benny Gantz showed political inexperience this evening. To talk about cooperation with the haredim and in the same breath to declare public transportation on Shabbat, civil marriages and the Reform Wall – this does not go together and will not happen. Benny Gantz, history has proven that preserving religious and traditional values is a guarantee for political and leadership success, while taking an anti-religious agenda is a recipe for failure." Science Minister Ofir Akunis (Likud) responded to the speech by saying that "we heard a lot of slogans, but we did not hear any positions. To obscure and hide positions is neither leadership nor statesmanship." "It's perfectly clear that when you have leftist positions, you have to hide them from the public in order to gather votes," Akunis added. Culture and Sports Minister Miri Regev said in response to the speech, "Benny Gantz is the new left. A speech full of empty slogans." “The connection between him and Bogie [Ya’alon] is a connection between the architects of the tie. This is the perception that says that we are not trying to win but only to get out safely." "Gantz is a clear leftist in his views. Left is left is left. He talked about [Hamas leader Yahya] Sinwar, but he is the person who crowned Sinwar. It would be dangerous to give him the defense portfolio or security responsibility for Israel," added Bennett. Communications Minister Ayoob Kara tweeted, "The greater the expectations (among those who had them...) the greater the disappointment. No vision, no security, certainly not an organized ideology. Why does Gantz think he’s fit to be Prime Minister? Because he was the Chief of Staff (and not a very successful one)? The last Chief of Staff who served as Prime Minister, Barak, was among the worst, left behind ruins, and disappeared from the stage immediately. We do not miss him." Opposition leader MK Shelly Yechimovich (Labor) said, “Courage is required not only on the battlefield but also in politics. Gantz said nice things, but it is unforgivable that during a dangerous period in which a prime minister is up to his neck in criminal cases and crushing democracy for his needs, that he did not say firmly that he would not sit in a government under Netanyahu. It is regrettable that someone who is supposed to bring a new spirit did not show public courage this evening and reserved the option to be a minister in the Netanyahu government." MK Mossi Raz (Meretz) tweeted, "After listening to Gantz's words, I reached the conclusion that he decided to continue not to say anything." Meanwhile, Hatnua chairwoman MK Tzipi Livni actually welcomed Gantz’s remarks. “There is no doubt that the state comes before everything else and the important question is what kind of Israel will we leave behind? Is this a state with the evil spirit that Netanyahu and his associates espoused or a state in the spirit of the Declaration of Independence with a Jewish majority and equality?” said Livni. "This is what I and Hatnua have been fighting for over the last few years. The real test is before us - how each of us will act to bring Israel back on track," she added.